Have you ever wondered about the bugs of the prehistoric past? This book introduces readers to amazing insect fossils that have opened scientists eyes to the tiny, six-legged creatures of the past. Many insects have been preserved perfectly in amber, while others left imprints in sedimentary rocks. Vivid color photographs of insect fossils and exciting diagrams are sure to catch readers interest. 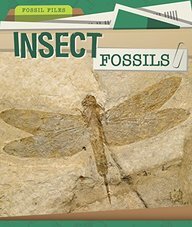 Engaging text and sidebars make this elementary science topic easy to understand and introduces readers to many fascinating facts about insect fossils.